1) Restore color that has been removed using original factory O.E.M exact match paint. 3) Restore metal primer to get better paint levels in the finish & promote adhesion between the steel panels or parts & paint layers. 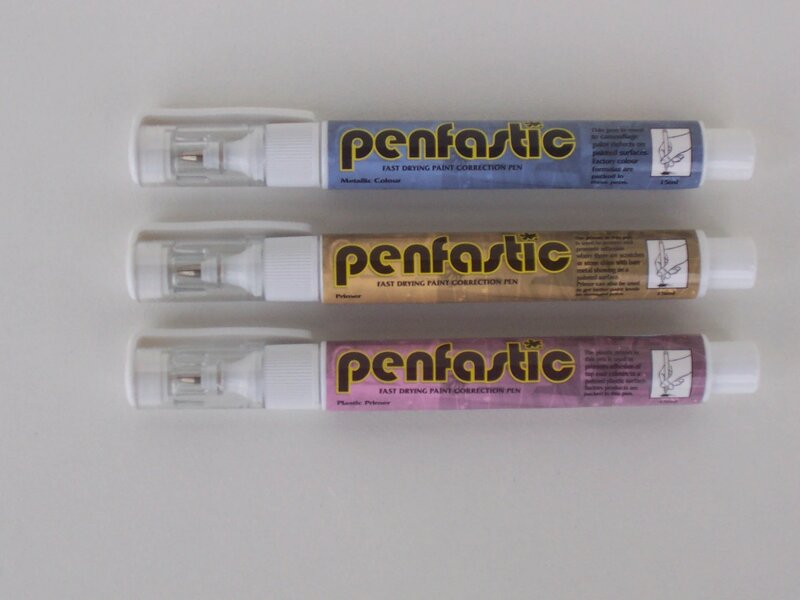 Definition: Plastic primer pen is used to promote adhesion between the plastic surface & applied top coat paints where the paints have been completely scratched by impact of foreign object. Failing to apply the plastic primer before painting will lead to a failed long term touch-up repair. Procedure: Remove plastic primer cap and discharge the initial amount to rubbish by pressing the pen down in an upright position and squeezing the pen body slightly. Apply 1 coat to the bare plastic. Allow to dry for 3 minutes in between coats in good weather. Definition: Metal primer pen is used to give better paint levels when touching up paint scratches & Chips, also protect and promote adhesion of top coat paint color layers on bare metal on vehicles where a foreign object on impact has removed factory paints. Procedure: Remove metal primer cap and discharge the initial amount to rubbish by pressing the pen down in an upright position and squeezing the pen body slightly. Apply 1 to 2 coats to the bare metal only. Allow to dry for 3 minutes in between coats in good weather. Definition: Non metallic paint color pen is used to cover deep discolored scratches, chips & paint defects caused by impact of an object where color coats are completely removed and/or left paint transfer that is impervious to solvent & is to thick to remove using cream cutting agents. Procedure: Remove cap and discharge the initial amount to rubbish by pressing the pen down in an upright position and squeezing the pen body slightly. Apply 1 to 2 coats to the damaged area where the color has been completely removed. Allow to dry for 5 minutes in good weather in between coats.